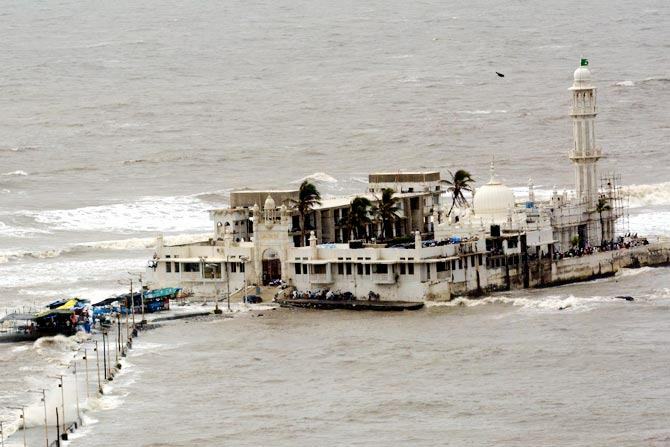 In a historic verdict, the Bombay High Court on Friday permitted the entry of women up to the restricted grave area of the famous Haji Ali Dargah on the rocks off Worli seashore. The ruling by a division bench comprising Justice V.M. Kanade and Mohite Revati-Dhere came in a Public Interest Litigation (PIL) filed by an NGO Bharatiya Muslim Mahila Andolan and activists Noorjehan Niaz and Zakia Soman in November 2014. The PIL had challenged a move by the Haji Ali Dargah Trust prohibiting women from entering the “sanctum sanctorum” area of the shrine built in 1431. The shrine comprises the grave of Pir Haji Ali Shah Bukhari, a Muslim saint revered by all communities. While permitting women to enter the restricted areas along with men, the court asked the Maharashtra government to ensure their safety and security. Terming the ban a violation of the fundamental rights of a person enshrined in the Indian Constitution, the judges stayed their verdict for six weeks to allow an appeal in the Supreme Court. A spokesperson for the trust said they will appeal against the ruling in the Supreme Court. The trust in June 2012 had banned women’s entry on the grounds that in Islam women are not allowed to touch the tombs of male saints and it was a “sin” for them to enter the area where the grave is located.